Revgear Freestyle Grappling Shin Guards are made from 100% leather and lightweight neoprene. These shin guards are designed with the same Formfit™ technology and ContouR Profile as Revgear Grappling Shin Guards, but with dual straps for easy on and off. Ultra-Lock™ hook and loop straps and lightweight neoprene prevent shin guards from slipping. Great for grappling. You get a pair of shin guards. 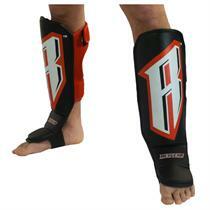 Email your friend about the Revgear Easy Off Shin Guards. Ask a question about the Revgear Easy Off Shin Guards.